What a difference 3 short decades can make. Back in 1982 in the 11th edition of the Overstreet Price Guide it was Donald Duck who ruled the roost. 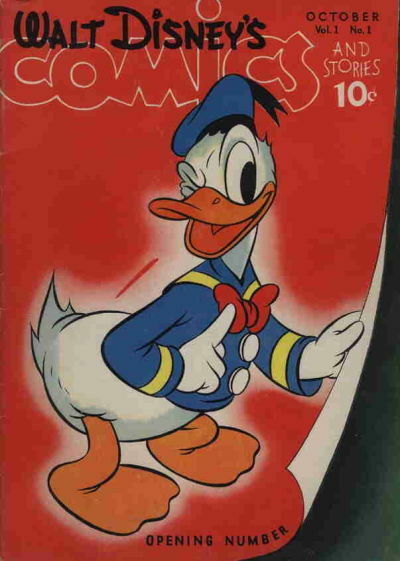 Of the top 50 comics by value in 1982 a whoping 10 were Donald Duck features, easily the most dominant character on the list. Fast forward to this year’s Overstreet Price Guide #41 and you’ll see that only 1 Duck book makes the top 50 (WDC&S #1). Oh how the mighty have fallen! Well they haven’t exactly fallen, Donald Duck books have continued to increase in value over the past 30 years, in fact the two prominent examples I’ve picked (our WDC&S #31 and Carl Bark’s first Duck book Four Color #9) have both increased in value about tenfold! Four Color #9 Overstreet #11 value $1,800 vs Overstreet #41 value $20,000 = 11 fold increase. WDC&S #31 Overstreet #11 value $750 vs Overstreet #41 value $7,000 = 9.3 fold increase. These returns sound pretty good until you start comparing them to some of the superhero results! Captain America #1 Overstreet #11 value $3,000 vs Overstreet #41 value $240,000 = 80 fold increase. Batman #1 Overstreet #11 value $2,800 vs Overstreet #41 value $285,000 = 102 fold increase. Now it’s easy to cook the numbers to have them point to where you want but I really did have a quick glance at many more examples and in each case the old hero books way outperformed the Duck books in this time span. People were not dumb 30 years, the early wave of collectors and investors immediately recognized the quality, impact and importance Carl Barks had on the medium. He was a true American master and one that has influenced almost everybody that followed him. When the Will Eisner Comic Book Hall of Fame was launched in 1987 only 3 inductees were inaugurated, Carl Barks was one of them. Carl Barks died in 2000 at the ripe old age of 99. 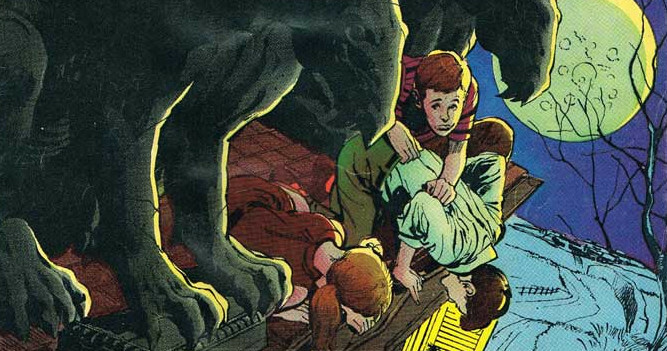 He actually started his Walt Disney’s Comics and Stories (WDC&S) run at the age of 40. Barks had been working for Disney for several years and worked on Donald Duck stuff for most of that time, he created concepts and storyboards for many Donald Duck cartoons and it was actually after Barks quit Disney in 1942 that he started drawing Donald for comic books. 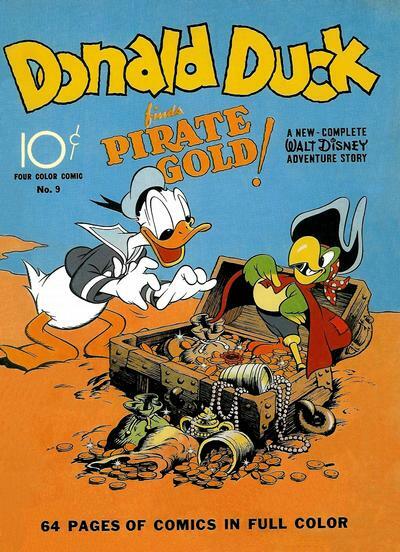 He drew half the story to the now legendary Four Color #9 (Donald Duck Finds Pirate Gold published Aug/42) as he was transitioning away from Disney. He then approached Dell looking for more comic book work and was given a chance with this week’s spotlight, WDC&S #31. Dell sent him a script and gave him poetic licence to change things as he saw fit. The rest as they say is history. ‘The Victory Garden’, Barks’ 10 page Donald Duck story in WDC&S #31 was the first of close to 500 duck stories Barks would churn out for Dell over the coming years. In WDC&S #31 Carl Barks is credited with the script (as a rewrite), the penciling, inking and lettering, he was a one man show! By the mid 1950s the Walt Disney’s Comics and Stories title was selling over 3 million copies a month. 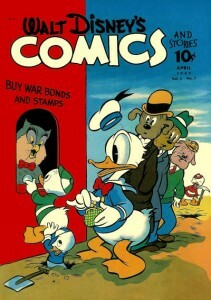 Artists and writers did not get credits in these Disney comics back then but fans quickly began to identify his storytelling and art style and Barks became known anonymously as ‘the Good Duck Artist”. 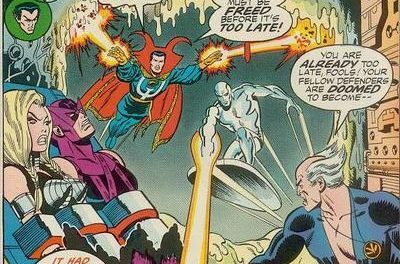 Personally I’ve always thought WDC&S #31 played too distant a second fiddle to Four Color #9. Yes Four Color #9 contains the 1st Donald story written for comics but Barks’ involvement was as artist only. It was with WDC&S #31 that the magic formula of Carl Barks doing everything was discovered. Surely our books $7,000 guide value should be more relative to the $20,000 enjoyed by Four Color #9. Have a look at Four Color #29 (Donald Duck and the Mummy’s Ring published September 1943), Bark’s second Donald Duck long story for the Four Color series. FC#29 was published 5 months after WDC&S #31 and yet enjoys a $14,000 guide value, that’s double our Spotlight’s value! Even Barks’ 3rd Donald Duck long story in Four Color #62 (Donald Duck in Frozen Gold published Jan/45) has a guide value or $5,700. By long story I mean the 24 -32 page stories Barks produced for the Four Color series. Barks’ Donald Duck stories for WDC&S were 10 pagers. Collectors and investors are rediscovering the Golden Age, and as they mine the rich selection of titles and issues that have for so long been overlooked they will come across issues like WDC&S #31 and these issues will see large price adjustments, upwards. Walt Disney is front and centre when we talk about the American pop culture legacy of the 20th century. What’s more, Walt Disney as a company is bigger than it’s ever been, a fact that will ensure that their original stable of characters like Mickey Mouse and Donald Duck will stay at the forefront of pop culture. Only 36 copies of WDC&S #31 have been graded by CGC as of this post, there are none graded better than 9.0. A CGC 9.0, the highest grade to date, sold for $4,481, what was then guide, back in 2009. A CGC 6.0 only got 60% of guide back in May 2011. Deals!! The 41st edition of the Overstreet Price Guide shows $2,800/$4,900/$7,000 as the splits at the 8.0/9.0/9.2 grades. Spot on about the #31, however the F.C#29 is considerably rarer. The CGC census shows 59 FC #9s of which 15 are what I’d call high grade at 8.0 or better by contrast only 36 WDC&S #31’s have been graded and only 6 of these have graded 8.0 or better. I know CGC census is not an indication of a true book’s scarcity but it can give a clue as to how tough they are to find relative to each other even factoring in that more FC #9s get sent down in proportion due to it being considered the bigger key. Walt,look again please. I wrote F.C.29,not 9. It’s tougher to find then WDCS 31 and F.c.9! But i agree with your assessments otherwise.